I have been a dedicated black coffee drinker since the tender age of sixteen. My grandmother introduced me to my first steaming porcelain cup during the refreshment time of a Lutheran Ladies’ Aid meeting. “It’s best just as it is, with no cream or sugar to cloud the flavor,” she instructed. I lifted the cup to my lips and felt the warning of hot porcelain on my lower lip but trustingly tilted the scalding liquid into my mouth. Tears formed at the jolt of pain. Do I swallow or spit it out in front of twenty women? I chose to do neither and toughed it out. My mouth burned and burned. I recovered from that scalding first mouthful and tried it again, this time noisily sipping a few drops because I did not want to disappoint my grandmother. She watched in approval. I was becoming a woman. I was neither here nor there about the flavor of the drink, that had to grow on me. Her approval was all that mattered. I started drinking coffee at home with my parents, feeling a bit more grown up with every cup and definitely clearer headed. Within six months, I had set a pattern for life; drinking coffee all morning long but stopping at noon. I probably have coffee embedded in my DNA as a required food group for my system. My combo coffee grinder and drip coffee machine is my lifeline in the mornings. I’ve gone through a long Gevalia period of life, as well as Dunkin Donuts, Starbucks, and various other high end brands. It took decades but I finally discovered that it’s not just about the flavor, it’s about the personal connection with the beans. My all-time favorites are grown near Antigua, Guatemala. 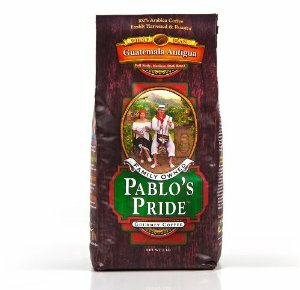 I get them locally in the form of Pablo’s Pride from Sam’s Club. With every sip, I am transported back to the cobblestone streets of colorful Antigua; listening to street musicians, exploring the nooks and crannies of the city with friends, and looking forward to “Beer O’Clock” on the roof top of our hotel where we celebrated the sinking of the sun behind the mountains every evening. I wandered through silent, misty coffee groves on that trip and watched Guatemalan men trudge along mountain trails with huge bags of freshly picked beans on their backs. I drank their fcoffee in local restaurants that would hand roast those beans, then grind them just for my solitary cup of coffee. I learned that coffee drinking isn’t about swigging down an entire pot, it’s about slowing down and savoring each sip with conscious awareness of all its mysterious flavors and swirling memories. I still drink my coffee every morning like my grandmother taught me, jet black and steaming hot. Thank you, Grandma for such a simple pleasure. May there be coffee in Heaven and you be enjoying a porcelain cup of it as I sip from my favorite mug, lovingly remembering you. Peace and be blessed for sharing that about your grandmother. Mine, also a Lutheran, used to joke it was coffee or kill something in the morning (Garfield-the-cat fan, bah). If coffee is an addiction, it’s a benign one and a benifit. What a veautiful letter remembering your grandma. Here is Spain, what is halloween there, is the all Saints day, a day to remember with respect to all our beloved peoplethat left us.